Every year you always have at least two or three kiddos that are obsessed with dinosaurs! Use that excitement and teach a dinosaur theme! Fill your classroom with dinosaur themed activities in every center in the classroom! When students are excited and interested in a theme, they will be more invested and learn so much more. There are LOTS of great, engaging ideas in this post! Make sure you grab the FREEBIES later in this post. 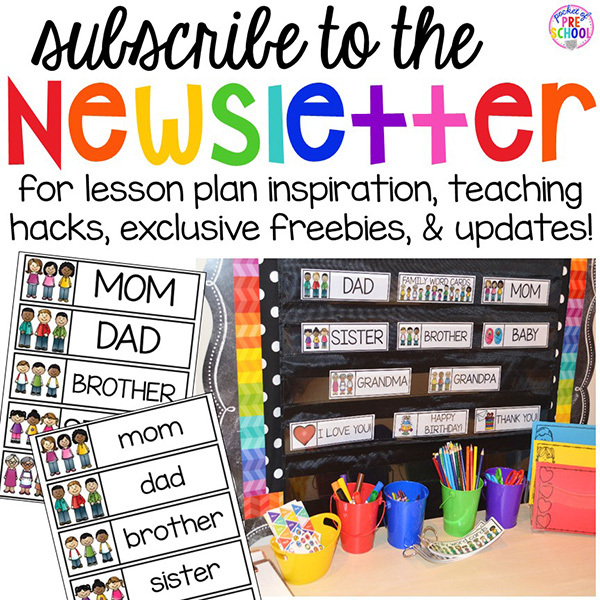 When introducing a new theme, always start with an AMAZING activity kiddos will go bonkers for! This will help to get them excited for the theme. When beginning a dinosaur theme, I always start with Dinosaur Letter Eruptions! Coat the bottom of a tray with baking soda, color vinegar with food coloring and place in cups. Also place dinosaurs and letters in the tray. Now the fun part: pinching, squirting, making eruptions, and talking about LETTERS! It’s important to take every opportunity to learn about letters, and it’s a bonus if it’s fun too! Paleontologists dig for bones so have students pretend to be paleontologists and dig for mini dinosaur skeletons and letters. Fun fine motor work and another opportunity to learn about letters. Dinosaur play dough mats? Yes, please! Kiddos can make dinosaurs with play dough during center time, use with early finishers or at arrival time. It’s a fun way to strengthen those fine motor muscles. My three-year-olds played Dinosaur Names over and over. I put out name cards for them to copy their name on the dinosaur. 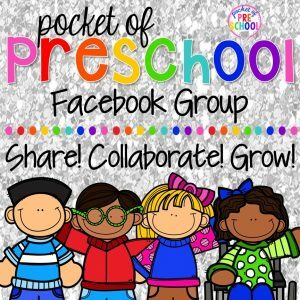 You can find the name cards for FREE in my Facebook Group (click on the files tab). I had my pre-k kiddos make their name from memory. If you have kinders, make sight word dinosaurs with the lowercase letter plates. 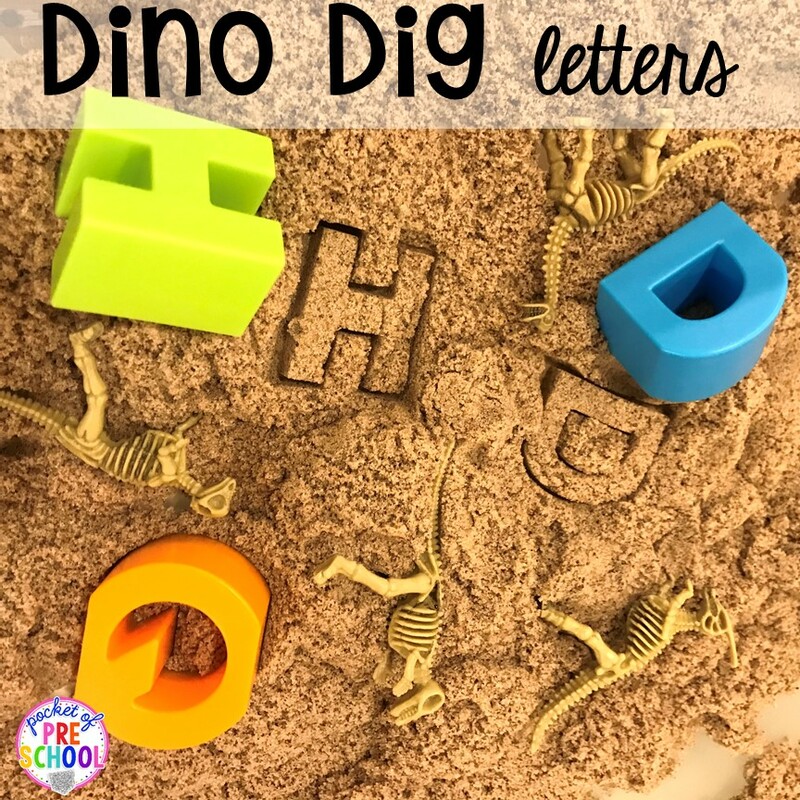 Dino dig bone letter match up (beginning sounds too). Place in a pocket chart or play on the floor. I only put out half or a third of the alphabet so the number of pieces isn’t overwhelming for my preschool friends. 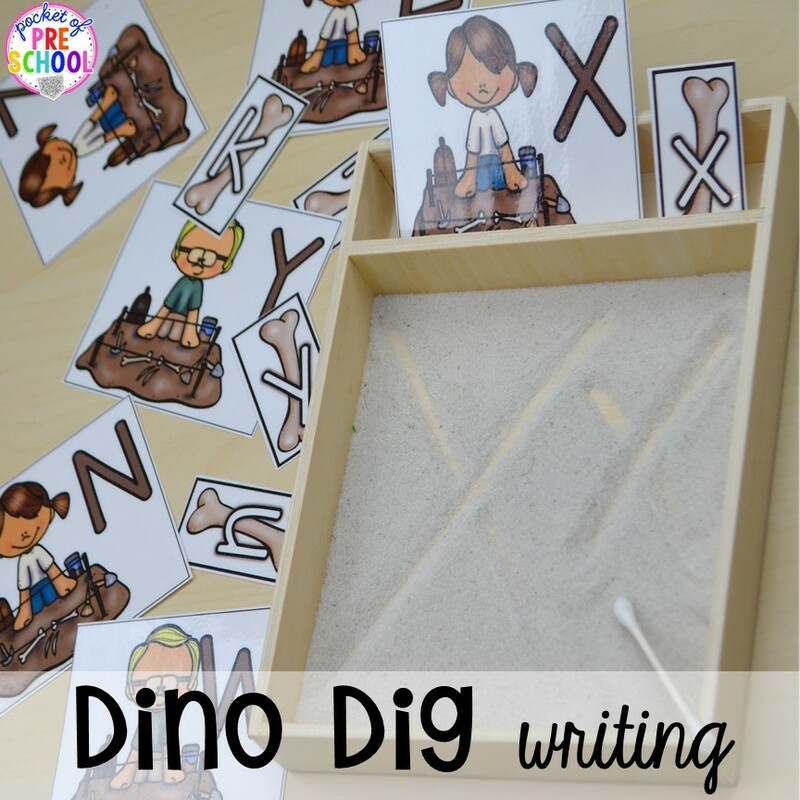 Keep the dino dig going and make writing trays. I used the other half of the game with the writing trays. Students matched the letters and sound pieces then used a bone (aka Qtip) in the sand. It’s important to practice proper letter formation. You can make it FUN and put the workbooks away! You can find the trays here or use a pencil box, shallow plastic tub, or metal pie pan. 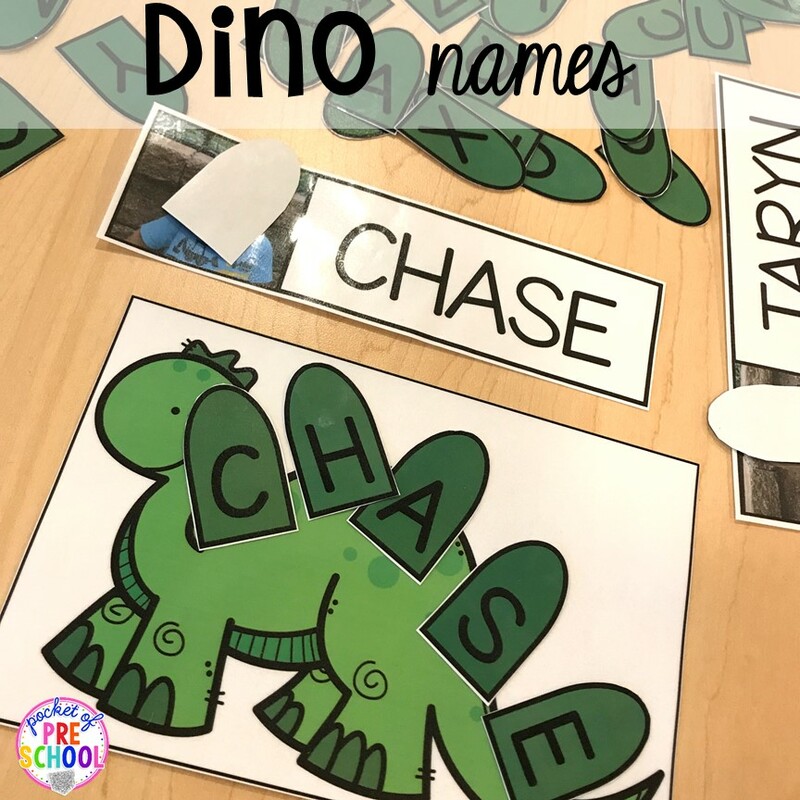 Put dinosaur word cards (uppercase for 3-year-olds and lowercase for pre-k), dinosaur writing paper, and dinosaur stickers to get kids excited to write! Help students fall in love with writing and become confident writers. 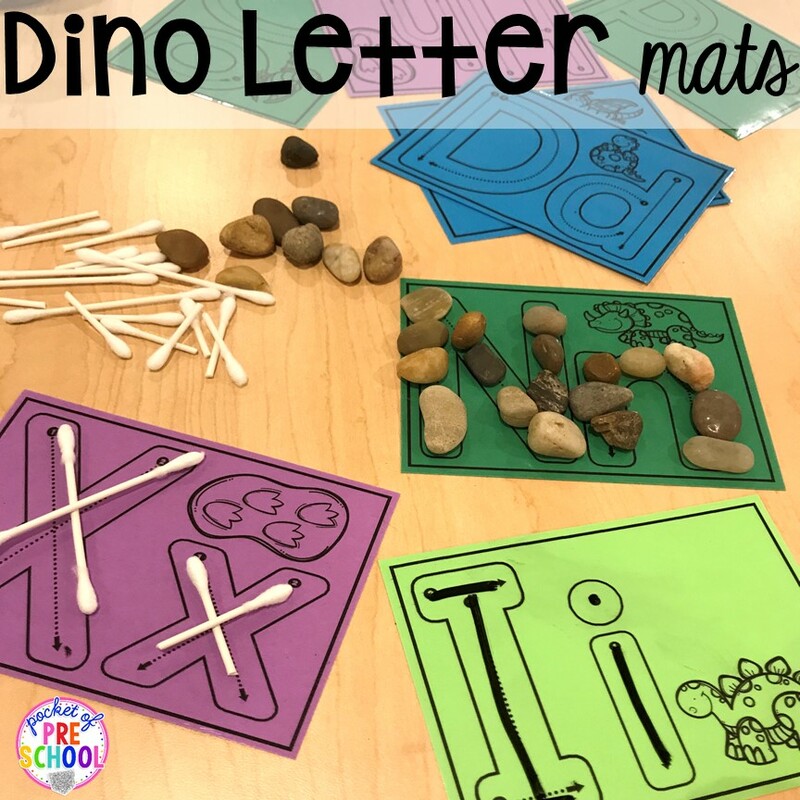 Dinosaur letter mats are another way for students to practice letters and identify letters. When they BUILD the letters with rocks, bones (Qtips), they are strengthening their ability to properly form the letters. You can also use dry erase markers to trace. I put the letter mats in a tub on the writing table. Use dinosaur word cards (or just write them on a chart) and vote! Have each student pick their favorite dinosaur, and write the first letter in their name on a post-it. Count the totals, talk about which is more, less, or equal to. Counting puzzles! Place in a sensory tub or just play at a table or with dino counters. Any way you play will be fun! Make it a file folder game by gluing one side of the puzzle to a file folder. Did I mention these are FREE too? Another super simple counting activity is a counting tray. Take a sorting tray like this one I found at the Dollar Tree and place numbers (or number window clings) in it. Students count out the corresponding number of dino counters. Super simple and so colorful. 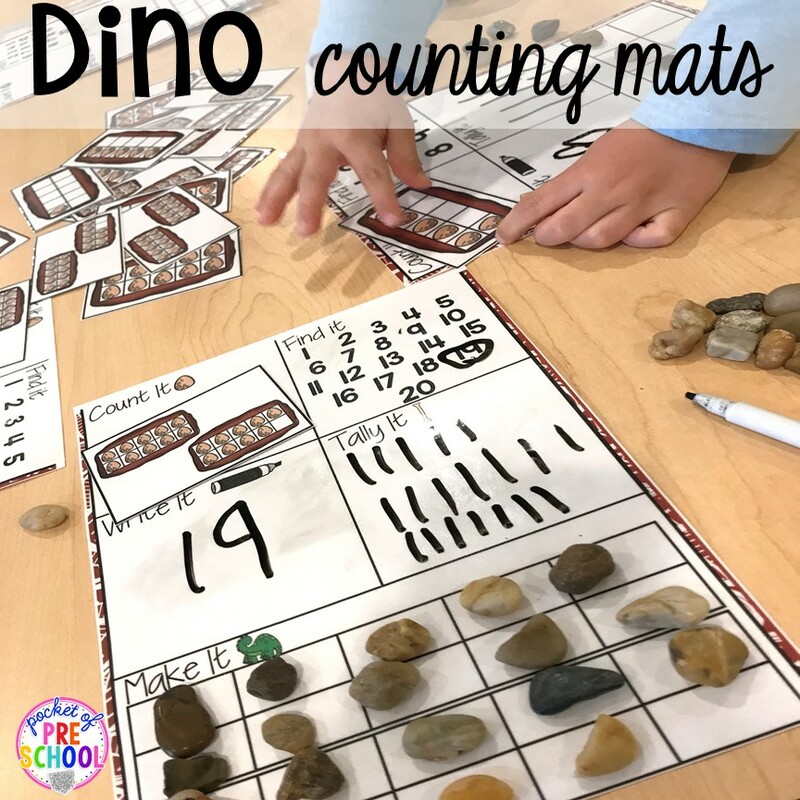 To practice representing a number various ways, use these dinosaur counting mats. Students count the ten frame, tally it, write it, find it and make it. It’s super easy to differentiate this activity too because it comes with a single ten frame board (1-10) and a double ten frame board (numbers 1-20). Color matching time! Some of my three-year-olds need more practice with colors so I created a fun color matching game with large Easter eggs and dino counters. Since dinosaurs hatched from eggs, why not make it a fun color matching game?! 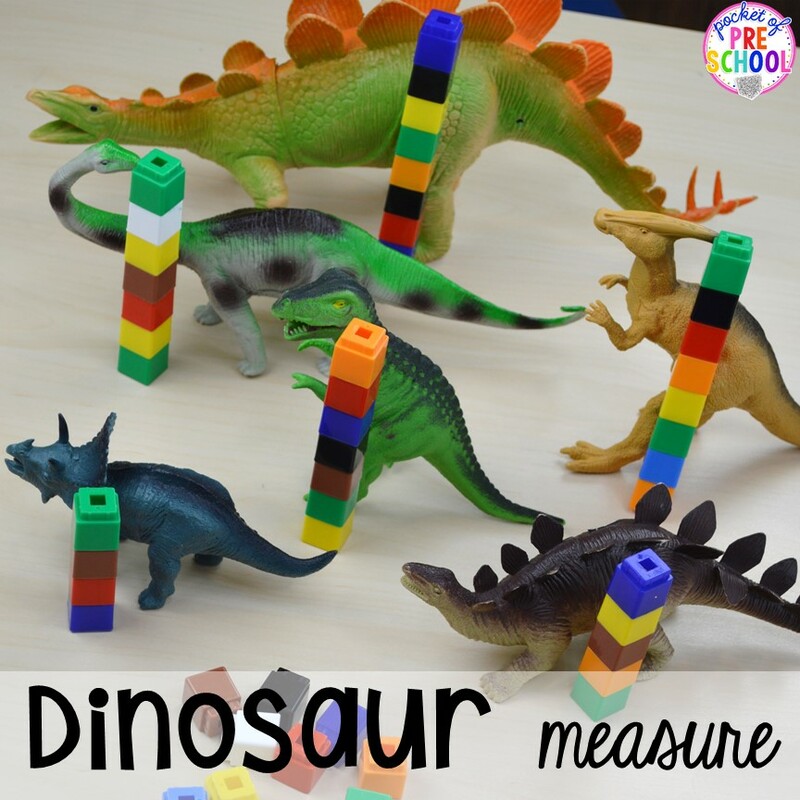 Let’s measure dinosaurs with connecting cubes! Measure the height, the length or both. Use tons of math comparison vocabulary and talk about which is the tallest, shortest, the same/equal? 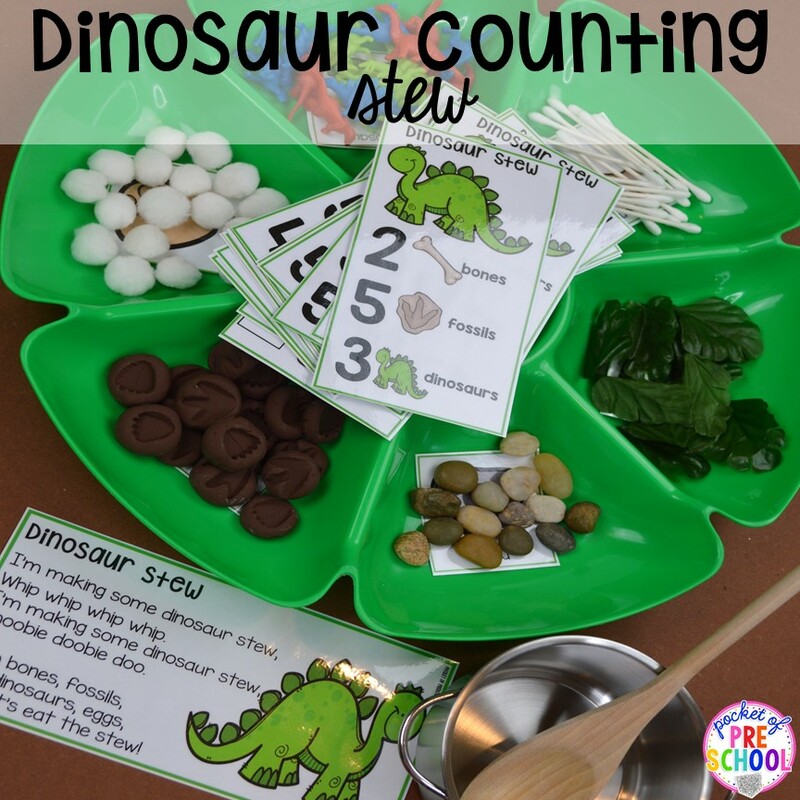 I think the Dinosaur Counting Stew is my favorite counting stew so far! Students are went bonkers when they saw it, and they were counting, singing and making stews like crazy. Read all about Counting Stews and Brews HERE. Since dinosaurs are extent we investigated rocks and fossils at the science table. Students measured, sorted and examined fossils and rocks. You can grab the Parts of a Scientist chart and discovery page freebie in THIS post. If you students LOVE rocks, do a rock science unit and explore rocks just like real geologists! Measure, sort and classify the rocks. You can grab my Rocks Science Unit on TPT here. Take the dinosaur theme to the blocks center with these positional words dinosaur posters. Challenge students to build and place the dinosaurs in different places and when you challenge students to build and engineer, they are doing STEM! Add some fake leaves (pulled off fake flowers from the dollar store), dinosaur books, rocks, and dinosaur figures. A classic preschool activity is to paint dinosaur tracks, and we just had to try it. To make it a bit more exciting, we used neon paint and small dinosaurs to strengthen our pincer grasp. Every time they made a dino track they had to pinch the dinosaur with their fingers! As always , we had a themed play dough tray and this one was a HUGE hit! We filled the tray with rocks, small dinosaurs, plastic plants, small dinosaur skeletons and tan play dough. They sculpted fossils, rocks and dinosaur habitats all while strengthening those fine motor muscles. Dino Dig Dramatic Play has to be one of my all-time FAVORITE dramatic play themes! It was easy to incorporate science, STEM, math and literacy into their play. Grab ALL the Dino Dig printables HERE. I’m working on a post all about the Dino Dig so stay tuned! I know this was a LONG post, but I just had to share all the fun dinosaur themed activities we did. We had so much fun learning and playing. Now you have some planning and prepping to do, and I’m here to help! Grab my Dinosaur Math and Literacy Centers and Dino Dig Site Dramatic Play pack from my TPT store. I did all the creating for you so all you have to do is print and prep! Make sure you check out my favorite dinosaur books for circle time and to place in centers too! Click HERE. LOVE these dinosaur activities? Pin this image!